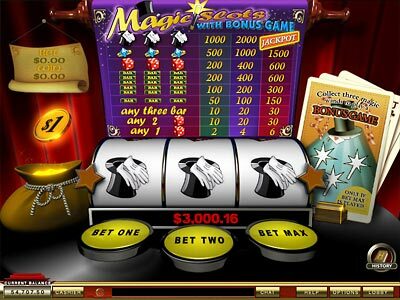 Magic Slots is a 3-reel progressive slot machine with bonus feature. Players can choose multiple coin sizes - there are 4 versions of $0.25, $0.5, $1 and $5 coins. The progressive jackpot is only available if you play max number of coins. Get 3 top hats on a max coin bet to claim the giant Magic Slots progressive jackpot - accumulated from the deposits of fellow magicians in all other Playtech online casinos. Collect 3 magic wands to enter the bonus round. You are standing center stage. The drums are rolling. In front of you are 4 shiny top hats. Each hat contains a different cash prize. Pick a hat to claim your prize. The bonus prizes are added to the line wins. Some of the winners: Adrieene F. won $15,258 Magic Slots jackpot on 23 March 2005 in Casino Del Rio. Click the image below to play Magic Slots at online casino Del Rio and get up to $600 free in bonuses. You can also see Magic jackpot winners and their stories and interviews. There is also another progressive game called Magic at Slotland online casino.